News & Press Releases By LW Consulting Inc.
As a company that puts people first—our clients and the extraordinary individuals that make up the LWCI team— we are grateful and want to show our appreciation by highlighting the difference they are making in the industry. Here’s your opportunity to learn more about what our experts do and what they love about their profession. 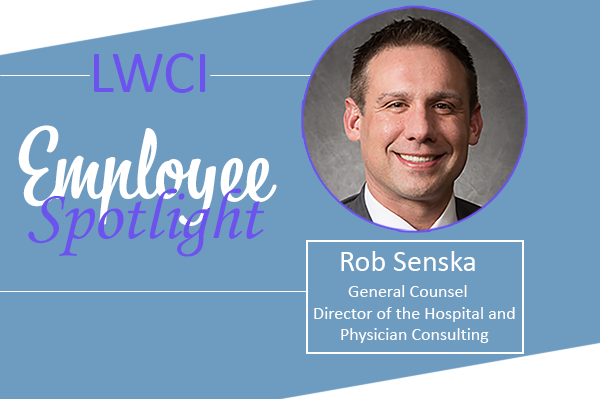 Rob is General Counsel and serves as co-director of LWCI’s Hospital and Physician Consulting Service Line. He has been with LWCI for two years. What do you do to help LWCI clients? We provide a number of valuable consulting services to physician practices, hospital and health system clients. These services include compliance consulting, auditing, contract negotiation services, operational assessments and HIPAA assessments. What do you enjoy most about the work you do at LWCI? I enjoy working with an experienced team of trained professionals to provide comprehensive healthcare consulting advice to clients on some of the most complex business issues. What inspired you to get into the business of healthcare consulting? The healthcare industry is my passion and has been my focus my entire career. I started with getting my bachelor's degree in Pre-Medicine, then pursued an MBA in Health System Administration. That lead me to wanting to pursue a law degree where I focused on Healthcare and Corporate Law. My experience has included working as Outside Counsel for top New York and New Jersey law firms and serving as both Chief Compliance Officer and General Counsel for Acute Care (hospital/health systems). Healthcare consulting was a natural step in my professional career, as I am able to leverage my years of experience to guide and serve our company's healthcare clients. What is some advice you would give to others starting out in the profession? Make sure you like what you are doing first. Healthcare is a dynamic industry and requires a constant state of learning. From my perspective, one cannot "dabble" in healthcare. If you are not always learning and growing you will fail, and worse yet, you will fail your clients. Copyright © 2015 LW Consulting, Inc.